There’s no doubting that cats are lovable, but they’re also pretty strange! Let one into the room, and within a minute, they’re meowing to get back out again. They also absolutely love to sit inside boxes (hence the saying, “If I fits, I sits”). For the most part, though, their wacky nature is what makes them so great. Their passion for the outdoors (and boxes) isn’t the only odd thing about these lovable furry creatures. One kitty owner recently discovered a weird quirk that’s quickly becoming an internet sensation. Hint: cats don’t just love sitting inside boxes. When you see it, you’ll have to try it, too! There’s A Quirk About Felines That’s Making Waves With Cat Owners Everywhere. For One Person, It All Started With A Stray Cord Lying On The Floor In A Circle. It Looks Innocent Enough, Doesn’t It? After All, It’s Exceptionally Common To Have All Manners Of Cords Looping Through Your House And Resting On The Floors. It’s Hard To Keep Them Organized, And Loops Like This Will Happen! In Fact, This Particular cat Owner Didn’t Even Notice The Looped Cord On The Floor Until It Became His Cat’s New Favorite Spot To Sit. The Man Realized That His Cat Would Go Straight For It Every Time And Sit In The Middle Of The Circle. He Couldn’t Quite Figure Out Why, Though. So He Decided It Was Time To Try And Experiment. Was His Cat Just Enamored With This One Coiled Cord, Or Did His Love Extend To Any Other Circular Shapes? To Figure This Out, He Made A Red Circle On The Floor Using Tape. Next, He Prepared Himself To Play The Waiting Game. It Didn’t Take Very Long At All, Though! He Had Just Finished Taping The Floor When Something Funny Happened. His Cat Immediately Came Running Over To Examine The Tape. And, Wouldn’t You Know It, His Silly Cat Immediately Sat Inside The Center Of The Circle Of Red Tape! His Owner Was As Baffled As He Was Deeply Amused. Wouldn’t You Be, Too, If You Discovered That Your Cat Had Such A Passion For Something As Basic As Circles? The Owner Decided Not To Stray Too Much From His Original Test. He Pulled Out The Tape And, Not Too Far Away From His Original Red Circle, He Created Another Circle. This One Was Slightly Smaller Than The First One, However. Just As He Suspected, His Cat Became Curious—and The Result Was Exactly The Same As The First Time! His Cat Seemed To Love The Second Circle Just As Much. Yet Again, He Wasted No Time Scurrying Over To This New Circle And Taking Up Residence. After Sharing His Results Online, This Cat Owner Was Amazed To See Owners From All Over Trying It And Sharing Their Results. As You Can See, It Turns Out That This Isn’t Just The Quirk Of One Particular Cat. The Feline Passion For Circles Might Just Be A Phenomenon. As You Can See, A Circle Made From Anything Will Do The Trick! This Particular Cat Owner Did Not Happen To Have Any Tape Handy. Instead, They Got A Little Inventive And Used One Half A Springform Cake Pan To Entice Their Cat. It Looks Like It Worked, Too! This Feline Pair Loved Their Tape Circles! Luckily, Their Owner Knew To Make Two Entirely Separate Tape Circles. That Way, His Two Cats Didn’t Have To Share! Cats Might Love Circles, But They Hate Sharing. Aw, Look At How Excited This Long-haired Ginger Tomcat Is To Be Sitting In The Center Of His Very Own Designer Terry Cloth Circle! Oh La La, C’est Tres Chic, Non? Raise Your Paws If You Love Circles! We Know This Little Guy Certainly Does. It’s Hard To Say Why The Cats Feel Compelled To Position Themselves In These Spots. Unfortunately, We Can’t Ask Them. The Best We Can Do Is Observe Their Behavior And Try To Derive Some Meaning From It. 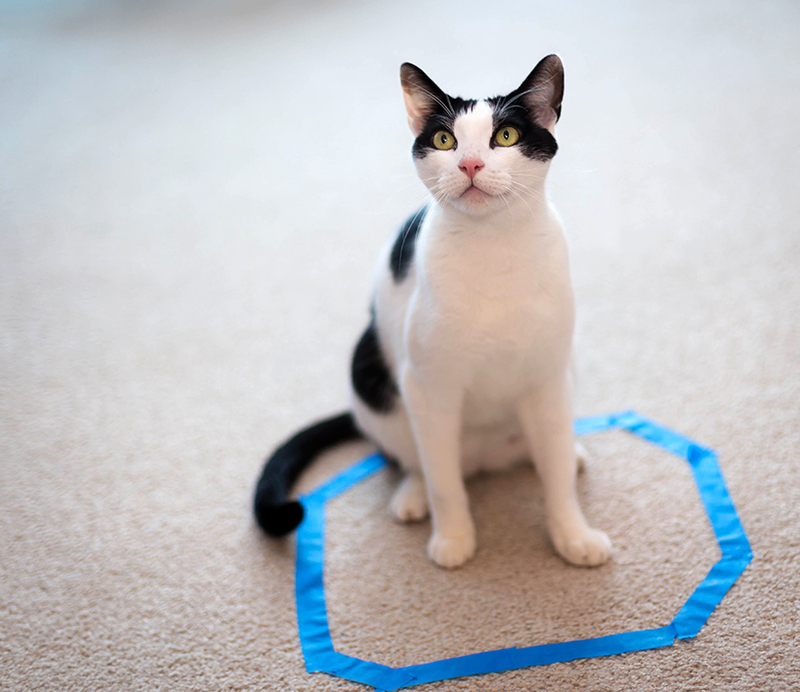 While Even Professional Scientists Aren’t Absolutely Sure What Draws Cats To Their Beloved Circles, There Are Plenty Of People Who Have Theories As To What Makes These Tape Circles So Compelling To Their Pets. The Most Popular Theory Is That The Illusion Of A Closed Space Gives The Cats A Feeling Of Security In An Otherwise Exposed And Open Area. That Does Have The Ring Of Logic To It. How Else Would You Explain This Cat Who Loves This Circle Made Of Cups? If You Plan On Trying This At Home, Just Know That It Doesn’t Even Have To Be A Circle! 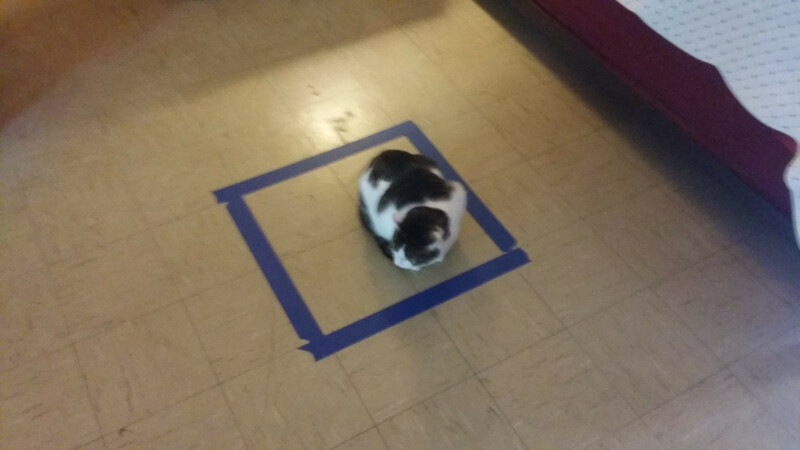 Look At How Happy This Cat Is Just To Chill Inside His Perfect, And Newly Acquired, Tape Square. You’d Think He Was Floating On A Bed Of Feathers. Of Course, There Are Always Going To Be A Few odd Cats. While This Persian Kitty Certainly Seems Interested In The Tape Circle, He Isn’t Entirely Convinced He Wants To Set Up Shop Inside Of It. You Could Say Its Existence Has Got Him On Edge. Your Pet Doesn’t Need To Be A Cat To Try Out This Trick, Either. While It’s Pretty Much Useless When It Comes To Dogs, Animals Like Ferrets Seem Similarly Entranced By These Circles. Who Would Have Guessed? For Most, However, It’s Like A Magic Spell! Look At How This Little Cat Couldn’t Help But Scuttle Over The Second This Ring Of Yellow Was Laid Out On The Tile. It’s Almost Like He Had No Choice In The Matter. “Looking For Your Belt, Human?” This Cat Owner Didn’t Even Mean To Give Their Kitty A Circle To Lounge Inside. He Just Happened To Toss His Belt On The Ground, And When He Turned Back Around, His Cat Had Been Lured Into Its Thrall. Blast, These Circles! Now That You Know Just How Crazy Cats Go For Their Little Private Circles, Maybe The Time Has Come To Try And Make One Of Your Own! Remember, You Don’t Always Need Tape. Check Out How Excited This Guy Sitting In A Circle Of Bananas. 17 Puzzling Pictures That We Just Can’t Explain — Can You?